Governors of the South-East states rose from a meeting in Enugu on Sunday evening with a decision that no land would be made available for the establishment of cattle ranches in the zone. Imo State Governor, Rochas Okorocha, stayed away. 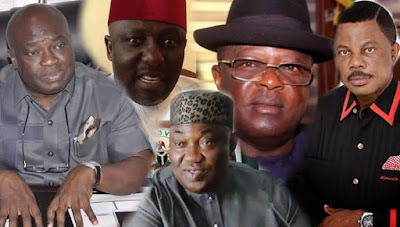 The meeting, which held at the Enugu State Government House, had the governors of Enugu (Ifeanyi Ugwuanyi), Ebonyi (Dave Umahi) in attendance, while Abia and Anambra were represented by the deputy governors. The President General of Ohanaeze Ndigbo, Chief Nnia Nwodo, presented the association’s ‘template on restructuring’ to the governors at the meeting, which ended late on Sunday evening. Addressing journalists after the parley, the Chairman of the South-East Governors Forum, Umahi, disclosed that the governors had agreed that ranching would not be allowed in the zone. Umahi explained that the reports that some South-East states had made land available for the establishment of ranches, based on a request by the Federal Government, were not true. The Ebonyi State Governor stressed that while the Federal Government had not asked for any land for ranches, the governors would not accede to such a request, should it be made. “No land in the South-East has been donated for ranching. We have not donated any land; we have not been asked to donate and we are not going to donate. “Ranching is not approved by the South-East governors in the South-East,” Umahi declared. The governors, however, raised the alarm over what they described as challenges posed by the movement of herdsmen in the South-East. They agreed to meet with heads of federal security agencies over the development.